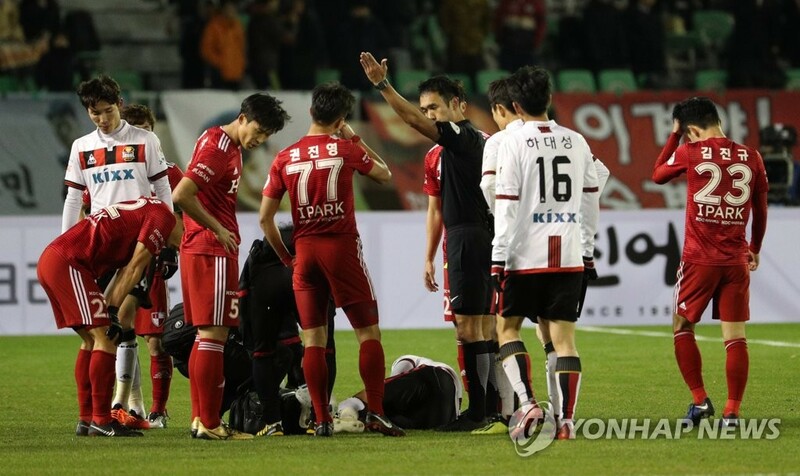 BUSAN, Dec. 6 (Yonhap) — FC Seoul beat Busan IPark FC 3-1 to open the K League promotion-relegation playoff on Thursday. Seoul produced a come-from-behind win after netting three goals in the second half in the first leg of the home-and-away series at Gudeok Stadium in Busan. The second leg will take place at Seoul World Cup Stadium in the South Korean capital. The winner of this playoff will play in the top-flight K League 1 next season, while the loser will be in the lower-tier K League 2. Seoul, led by head coach Choi Yong-soo, dropped into the playoff after finishing in 11th place among 12 clubs in the K League 1. Each season, the last place club in the first division is demoted directly to the K League 2, while the second-to-last team must survive the playoff series to stay in the top flight. Seoul have never been relegated to the second division in their club history.